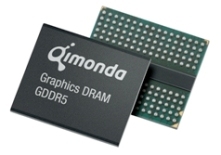 In advance of its likely acceptance by JEDEC as an international standard for memory implementations, Qimonda said today it is now sampling the first Graphics Double Data Rate 5 memory in 512 Mb modules. It is graphics memory that analysts attribute to the stellar rise of Qimonda, the Infineon division yet to be spun off, into the global #3 supplier position on iSuppli's list, behind Samsung and Hynix Semiconductor. Having been on the crest of the GDDR3 wave put Qimonda there, and now the company and its parent are taking a gamble on hopping directly over one generation of memory and riding the GDDR5 wave at its outset. As memory gets faster, like any technology that deals with signaling, it has to have a strategy for reducing noise. GDDR5 approaches this first by dividing its clocks into two groups, one for registers (reading) and a second group for write operations, slightly deferred or "forwarded" so that when it reaches the end of the process loop, the signal is in sync. But perhaps even more importantly, GDDR5 resurrects the concepts of cyclic redundancy checks (CRCs), which led to the explosion of 9600 bps modem technology in the early 1990s. Here it's used to ascertain the integrity of signals in a noisier, jam-packed, higher-traffic environment. "In GDDR5 the transmitted data is secured via CRC (cycle redundancy check) using an algorithm that is well established within high quality communication environments like ATM networks," reads a Qimonda white paper on GDDR5 (PDF available here). "The algorithm detects all single and double errors with 100% probability." This morning, Qimonda promised it could achieve a 3x performance boost over GDDR3 currently being shipped by, among other factors, doubling their bandwidth to 20 GB/sec per module. That "per module" is important, as it points to the possibility of simultaneous writes to multiple 512 Mb modules by multiple cores (Is anyone at Sony listening?). One of Qimonda's early customers could be Intel, one of whose stealth projects is a GPU/CPU combo processor code-named Larabee. Engineers expect to see the first samples of this chip late next year, and although it would put Intel on a par with AMD in the graphics department, analysts are actually seeing it as an "nVidia killer." Larabee would reportedly require GDDR5.